Welcome to LW Plumbing & Heating Services, respected and well established plumber and gas engineer in Altrincham, we specialise in a wide range of plumbing and heating services from dripping taps and leaky faucets to boiler installations and emergency repairs. 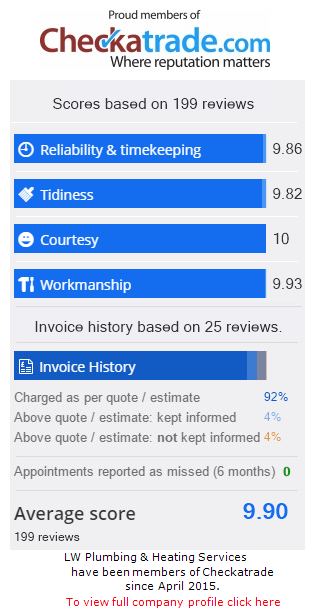 We are second to none in Altrincham when it comes to plumbing and heating services and we pride ourselves on our level of service and competitive pricing. Not only are our team of plumbers and engineers fully qualified, additionally they carry years of industry experience making sure that their work meets the high standards our customers expect. We are a leading independent company specialising in the service, maintenance and repair of domestic gas appliances. We realise that the majority of people think boiler repairs cost an arm and a leg, so our process for boiler repairs gives clients the best possible money saving solution. Free of charge fixed price quotes on all our plumbing and heating services. W’lle uncover the problem and let you know specifically how much it is going to cost to fix it. If you do not want us to go ahead with the repair, then we won’t. A qualified Gas Safe registered heating engineer will talk you through each option available, so that you can choose the best solution for you. We’ll give you free advice about your boiler as some old boilers aren’t worth repairing. Sometimes a new boiler installation works out less expensive in the long run. Condensing boilers or combination boilers always have a manufacturers guarantee providing plenty of boiler breakdown cover. This is generally between 1 year and 7 years dependent upon your chosen boiler make and model. We generally fit ‘A’ rated (SEDBUK’s highest rating for energy-efficiency) energy efficient condensing combi boilers with a 7 year parts and labour guarantee. You can choose any combi boiler make and model you want for your boiler replacement or installation and we’ll give you a quote for that new boiler cost as well as warranty info. Our Boiler servicing service has been designed and vetted by Gas Safe making sure your boiler is serviced & maintained to the highest of standards at the best price around! Maintaining a boiler is a crucial part of a successful heating system as it will increase the life of the product as well as prevent any issues surfacing. A boiler must be looked at on a regular basis and checked to ensure all aspects of the appliance are in proper working order. This can stop any prospective health hazards from arising and can provide your family with a safe and reliable boiler. Bear in mind, a well maintained boiler is a safe boiler. Stuck without heating or hot water? Suffering from recurring boiler breakdowns? Need a new bathroom suite installed? Whatever your plumbing work is, the team at LW Plumbing & Heating Services are on hand to help. Whether you need a leaky tap fixed or an entire central heating system installing, our on call round the clock plumber in Altrincham has the essential experience and expertise to complete the job to the highest possible standards. Does your heating system need power flushing in Altrincham? Cold or Luke Warm Radiators are amongst the indicators that you’ve got a problem with your central heating system. Slow Heating Response is one of the symptoms you’ll need a powerflush for your central heating system, typically identified when radiators take a long time to warm up or you dont get the heat out of them needed. When you’re hearing unfamiliar noises originating from your central heating pump, surges grating this is a obvious warning your pump is struggling and becoming blocked with sludge. Many reasons exist why you ought to invest in power flushing services, and here at LW Plumbing & Heating Services we know that our clients ought to be kept informed of these facts given that the more sludge that’s taken out, the more effective your heating will be. LW Plumbing & Heating Services offer a 24-hour emergency plumbing service which is unrivalled by any other gas engineer in Altrincham. Available day and night, our professional team will never turn down your calls or delay in turning up in any emergency predicament. We understand that burst pipes and gas leaks can be very stressful and we’ll always endeavor to get to your home as fast as possible to make things safe. Little issues trigger even bigger problems if not repaired straight away. Getting a boiler service annually can help to prevent needing boiler repairs. Call now to book an engineer for a free of charge quote. Make us your first to call gas engineer in Altrincham for all gas, plumbing and heating work.